The weather – that is. Seriously, I don’t want to jinx anything, but it is quite nearly perfect outside. So much so that I am taking up jogging again. My goal is to get up in the morning and do a quick run outdoors, but still keep up my evening workout regimen as well (NTNW, your post where you talked about running inspired me to get outdoors). Anyway, it’s so nice to be OUTDOORS. I hope that I can spend a lot more time outside as summer approaches. For one thing, it’s just healthier to be outside, instead of in and around the house all the time. For another, I hope to get a little more tan, because I looked at some old pics, and people, I am pasty pale. My Polynesian relatives should totally not claim me. What’s the weather like where you are, and how are you enjoying, or dealing with, it? 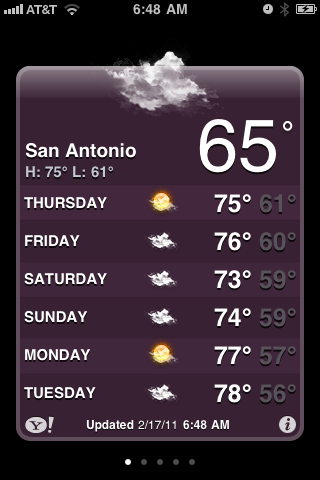 This entry was posted in Fitness and tagged perfect weather, south texas weather. Bookmark the permalink. Being only a few hours north I am rejoicing with you! The weather is fabulous here in Dallas. I just want to be outside!! Craig and I spent last Saturday studying at an outdoor cafe in the middle of downtown. It was wonderful. I wish I could say this weather makes me want to exercise outside, but it really just makes me want to have cocktails on a patio somewhere. And come Friday happy hour, it is SO on!! Gah, finally, it’s NICE OUT!! I love it. It was the same way here!! I studied outside, I walked around, and I enjoyed Thursday and Friday more than anything since the holidays.